Co-founder of Just Moms STL Karen Nickel (at podium) said her group has the support of Missouri’s U.S. Senate representatives in their efforts to meet with the EPA. An activist group of St. Louis area moms concerned about underground smoldering at the Bridgeton Landfill plans to picket outside the Environmental Protection Agency’s Washington, D.C. offices on Wednesday. Members of Just Moms STL went to the nation’s capital this week in another attempt to get a meeting with EPA Administrator Gina McCarthy. The group said it hoped to discuss the proximity of the subsurface fire to the nearby radioactive West Lake Landfill in Bridgeton, where World War II-era nuclear waste is stored. Residents have worried for years about what could happen if the fire reached the nearby radioactive waste. But, despite an onslaught of calls to the agency’s scheduling department, group co-founder Karen Nickel said its latest effort Tuesday was met with silence. She said the group has tried for two years to secure face-time with McCarthy. The EPA previously said it plans to build a fire break to prevent the smoldering from reaching the waste, and it is also testing and studying what would happen if it does. 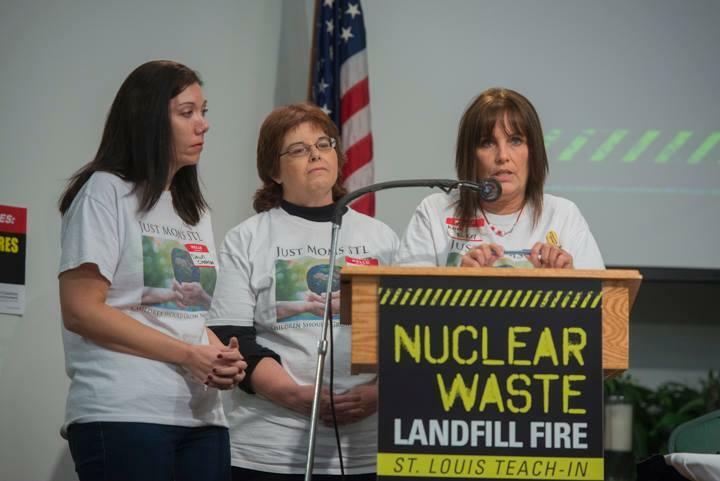 Just Moms STL’s trip to D.C. comes shortly after the U.S. Senate passed a bill to put the Army Corps of Engineers in charge of West Lake Landfill, instead of the EPA; many residents had called for such a change because they felt the EPA is taken too long to implement remediation. Group representatives met Tuesday with Democratic Senator Claire McCaskill and Republican Senator Roy Blunt. But Russ Knocke, spokesman for landfill owner Republic Services, said the moms group’s efforts amount to a distraction. But Nickel said Just Moms STL wants to plead for the EPA to use its authority in overseeing the Superfund site to evacuate residents. She said many residents are also alarmed about the strong odors produced by the subsurface fire and health problems they have experienced. The EPA and the Missouri Department of Natural Resources both previously reported studies found no human health risks from air pollution from the site. Similarly, the federal Agency for Toxic Substances and Disease Registry (ATSDR) also stated that while it found higher radon levels in the air around the radioactive West Lake Landfill site, it posed no risk to human health. But the St. Louis County health department announced Monday that in two weeks it will start a health survey of any respiratory symptoms experienced by residents living within two miles of the Superfund site. Nickel said her group also wants the EPA to order a property assurance plan to buy out homes around the landfill at fair market value for residents who want to leave. The EPA did not immediately return a request for comment. While in D.C., the organization is teaming up with Water You Fight For, a group made of residents affected by the water crisis in Flint, Mich. Nickel said the EPA turned “a blind eye on the children of Flint,” and it is now doing the same in St. Louis. “Their community suffered through silence from the EPA just like we are here in Bridgeton, and I think it’s time for the moms of Flint and the moms of St. Louis to make a pact and stay strong to fight for our children,” she said. Despite the unsuccessful attempts to get a meeting and no guarantees for the future, Ed Smith of the Missouri Coalition for the Environment is supporting the moms and their push. “Gina is in Washington, D.C. and not St. Louis, so we have to go there to let her know that we want that meeting,” he said.